Wasim A. Haque, M.D., F.A.C.E. Dr. Wasim A. Haque received his medical degree from the Aga Khan University Medical College in 1991. Following medical school, Dr. Haque began his Internal Medicine training at Milton S. Hershey Medical Center (Penn State University College of Medicine) and completed the residency and then a fellowship in Internal Medicine. Thereafter, he spent one year as an Instructor and Fellow in Medicine and Cardiovascular Research at the University of Rochester School of Medicine & Dentistry in Rochester, NY. Between 1997 and 2000, Dr. Haque practiced Internal Medicine in Auburn, NY. Dr. Haque obtained endocrinology training at University of Texas Southwestern Medical Center in Dallas, TX and completed his fellowship in Endocrinology, Diabetes and Metabolism. He is Board Certified in Endocrinology. He is highly qualified and skilled to take care of full range of endocrine disorders. Dr. Haque’s primary areas of interest are: insulin resistance, hyperlipidemia, thyroid disorders, osteoporosis and diabetes mellitus. 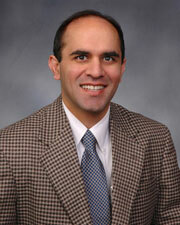 Dr. Haque is a fellow of the American College of Endocrinology. He is also a member of the American Diabetes Association, American Association of Clinical Endocrinologists and the Denton County Medical Society.